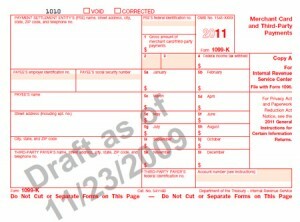 The Housing Assistance Tax Act of 2008 included an IRS section called 6050W, which requires credit card processors to start reporting merchant’s gross sales beginning in January 2012 for the 2011 calendar year. The reported gross income will not be adjusted for credits, chargebacks, returns, fees & reserves. 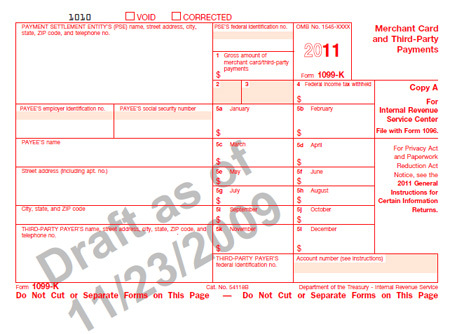 This reporting requirement includes an annual filing on a new form called 1099-K. Part of the requirement is processors must match the merchant’s company name and federal tax ID number “TIN” with the IRS TIN database. If this information does not match, processors will be notifying merchants via phone calls, letters, emails or notices on their monthly processing statement. It is imperative that merchants respond to such notifications. In the event that merchants do not respond, processors will be required by the IRS to begin withholding 28% of all deposits. These funds would go directly to the IRS and the merchant would not receive them back until they file their tax return. Merchants may also be assessed a fine by the IRS of $150/TIN for non-compliance. Processors are having to invest resources, money and labor in order to implement and manage the processes needed to meet these new reporting requirements. As you may have guessed, the industry seems to be taking a similar approach as they did with PCI Compliance by passing on this expense to the merchant. It is unknown at this time what the industry will do as a whole, but so far some very large processors have already assessed a $99 yearly fee. Most processors have yet to make an announcement on what they are going to do but should as the year progresses. Did you find this information helpful? If so, become one of our merchants! This is one of the many benefits you receive when you allow us to handle your processing. Give me a call (800) 605-3972 ext 111.